This is an archive for the Los Altos Robotics FIRST LEGO League (FLL) program. Note that starting with the 2016 FLL season, Los Altos Robotics will no longer host FLL events. For information on VEX IQ, Botball or FIRST High School Robotics, follow the links from the Home page. This page may contain some out of date information. For registration information with NorCal FLL, please visit www.norcalfll.org. For registration information with US FLL, please visit here. FIRST LEGO League is for fourth grade through 14 year olds. The fall season runs from September through November. The FIRST FLL regional affiliate, Playing At Learning, coordinates Northern California FLL with over 250 teams every year. In addition, they run other smaller robotics programs such as FIRST Tech Challenge and JR. FLL. Scrimmages are events to let kids practice running the robots under simulated tournament conditions and see what's really working. The scrimmage and tournament have completely independent registrations. The scrimmage is an informal event intended to support local area schools and community. To participate in a Los Altos scrimmage you register with Los Altos Robotics. A Tournament is an official FLL qualifier. Starting in 2015, Los Altos Robotics will not hold a qualifying tournament. To participate in a qualifying tournament you register through NorCal FLL. The Share-A-Thon is an opportunity for kids to share their research project results with the community and get feedback for their presentations prior to the tournament. Scrimmages are lots of fun for spectators. If a child may want to participate in the future, they can stop by the event for an hour to see what it is like. If you are already a participant at another venue, please do not video robots. If you would like to help run the FLL scrimmages, please email or call at the contact information listed below. Participation is great fun and great way to give back to the community. Los Altos Robotics runs the local scrimmages and provides information for teams in the community. We do not organize teams but we do provide links to related web sites and have an "I need a team" program to help teams in the local community find other team members. The 2014 Parent Orientation presentation (PowerPoint version) describes the program in Los Altos and is useful. We also provide the TigerBots email list for local event announcements. Send an email to Michael Schuh to be added to this list. NorCal FLL is the official FLL organizing group in Northern California. They provide information on how to organize and coach teams. They also provide a central registration for all Northern California tournaments. They have a web site, community forum, and email announcement list at NorCalFLL.org , NorCalFLL Community. Make sure you register for a Bay Area tournament when the registration opens in early October. Also join the norcalfll-announce google group, and watch for e-mails to be notified of key events to ensure everything is in order for your team. NorCalFLL will have a regularly updated registration status page once registration for the qualifying tournament is open. Note that this is separate from FLL team registration, which must be done through the U.S. FLL site. FLL is a worldwide program with over 16,000 teams involved. The official web site is: FLL Worldwide . They run the official USA FLL team registration site and ship out all Challenge sets and FLL robot kits. For local teams, start with the NorCalFLL web site to get instructions for organizing your team. You will be directed to the USA web site as needed. The Los Altos Robotics 2012 FIRST LEGO League Flyer (PowerPoint version) is a 1-page flyer with a brief description and schedule. It advertises the availability of the FLL program to children in Los Altos and Los Altos Hills. It has all of the key dates and events for the 2012 season. Feel free to distribute it to anyone you think might benefit from seeing it, such as potential team members and coaches. Many Los Altos schools distribute this flyer in their office. 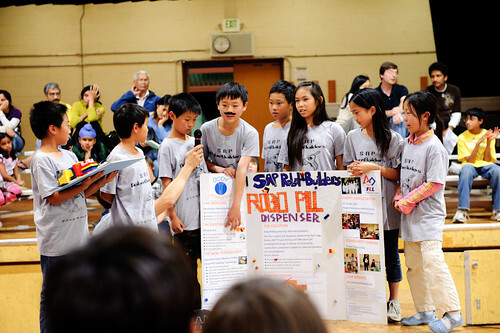 The Los Altos Robotics FLL Parent Orientation presentation (PowerPoint version) is a 20+ page presentation that describes the program in Los Altos and gives tips on how to form teams. This is a good place to start if you are new to FLL. The Participating in Los Altos Robotics FLL page gives instructions specific to starting or finding a team, participating in the Los Altos Robotics league, and information on how to register teams for the scrimmage and local competition. FIRST® LEGO® League (FLL®), created through a partnership between FIRST (For Inspiration and Recognition of Science and Technology) and The LEGO Group, inspires future scientists and engineers. In FLL, kids ages 9 to 14 are immersed in real-world science and technology challenges. Teams design their own solution to a current scientific question or problem and build autonomous LEGO robots that perform a series of missions. Through their participation, children develop valuable life skills and discover exciting career possibilities while learning that they can make a positive contribution to society. Using the LEGO MINDSTORMS Robotics Invention System, teams of students, mentored by coaches, parents and teachers, receive a Challenge which is different every year. Each team is then responsible for the design, construction, programming, and testing of their robot to compete in the Challenge. The brain of a LEGO MINDSTORMS robot is a micro-computer mounted inside a super-sized LEGO brick. This is called the NXT. The LEGO MINDSTORMS Robotics Invention Challenge Kit includes an NXT brick, over 700 LEGO pieces, motors, light and touch sensors, gears, a CD-ROM including the NXT code programming environment, and a USB cable to download the program directly into the NXT on a robot. The What is FIRST video featuring Dean Kamen, Founder of FLL, provides an overview of FIRST, its mission, and the four FIRST programs - Junior FLL, FLL, FIRST Tech Challenge (FTC) and FIRST Robotics Competition (FRC) which span from Kindergarten all the way to 12th grade. For an inspirational message about the value of science, have your kids watch i.amFIRST: Science is Rock and Roll featuring will.i.am of the Black Eyed Peas and other celebs like Miley and Justin. Will.i.am created and paid for a one hour program on the FIRST program in August of 2011 called "i.am.FIRST: Science is Rock and Roll". One of the local Mountain View High School FRC Spartan Robotics team members, Scott, was interviewed for it and appears with his dad 35:14 into the video. We Ate The Mat Web Site: with links to Open Source NXT Programming Environment. Click Here to let us know links to other FLL team web sites. Starting teams is an important part of the Los Altos Robotics program. The following documents provide a wealth of information for forming a new team. You do not need to be a technology person to form a robotics team with your child. However, you do need to be dedicated, read the coaching documents that are provided, allocate enough time with kids, and be ready to do a bit of homework. If you, or one of the parents who is helping, can install computer games and get them working when there are minor problems, then you know enough technology to help the kids in case something breaks. Start by reading Participating in Los Altos Robotics FLL. This page gives instructions specific to starting a team and participating in Los Altos Robotics. It also contains the I need a team registration form in the More Ideas for Organizing and Starting a Team section and information on how to register your team for the scrimmage and local competition. FLL organization's How To Start An FLL Team page. Northern California FLL How To Start An FLL Team page. The tournaments in November are qualifiers for the Northern California Championship tournament, both run by NorCalFLL. Michael Schuh's FLL Coach's Guide: This page outlines Michael's advice to new coaches. He has coached one or two teams each year since his first FLL season in 1999. He has developed a coaching style that works and describes it here. FIRST LEGO League Registration FAQ: Answers to the common registration questions that have been sent to Michael Schuh. Please try checking here before emailing. You might quickly find your answer. FIRST LEGO League Coach and Team Resources page has many resources for all aspects of forming and running FLL teams including the very useful Coaches' Handbook. I think every coach would benefit from reading this 109 page book cover to cover. That page also has recordings of 13 coach calls where people share their expertise on various aspects of forming and leading FLL teams. Team Resources such as the Los Altos Robotics Flier and presentations from the Los Altos Robotics Orientation and Coaches Training are archived available. These are the materials that we have created to help people understand the program and form and have better teams. Through the years, Michael Schuh has collected FLL Programming and Design Suggestions and has archived them for all to use. FIRST LEGO League Simple Playing Field Design: Tells about how we have built playing fields for the teams. Competition Results and Files is where you will find the scoring results from past years Los Altos FLL competitions. Also included are the Excel scoring spread sheets and PowerPoint certificate files used in the competitions. Most robotics teams from Los Altos have fun, work hard, and demonstrated gracious professionalism. A few have also been fortunate enough to be recognized at some of the major state and national robotics tournaments. The Los Altos Robotics State and National Team Award Page recognizes those teams and we hope inspires future teams. It takes a lot of people to help us run the teams and make the competition a success. We will need help again this year. Please help out however you can and in whatever way is satisfying and fun for you. Teams need Team Coach(1), Assistant Coach(1-2), Team Manager(1), and a Practice Session Host (provide a large room for the team meetings). The competition volunteer page is where you can learn about how you can help out at a Scrimmage. Each team is expected to provide a volunteer for each event the team participates in. The Board of Directors has open positions and the people currently holding positions can use some help. Come join us at a Board meeting to see how you can participate! Check the Board of Directors page to see a list of Board members and position, and a schedule of future board meetings. Contact Michael Schuh, Michael LosAltosRobotics.Org, 650-965-8037 Home, 650-604-1460 Work. The TigerBots Email List is used for all Los Altos Robotics announcements. It is very helpful if at least one person from each family involved in FLL and VEX IQ in the Los Altos area joins the Los Altos Robotics TigerBots yahoogroups.com email list. The TigerBots email list page has more information about the list and directions on how to join it. Also see the much more thorough More Information section in Michael Schuh's FLL Coach's Guide for additional resources. 09 Oct '05 Added Help section, Schuh. 11 Sep '05 Added in short More Info section and reordered the Quick Index, Schuh. 21 Aug '05 Added Resources Area description and link, Schuh.